We are solving the problems in one dimensional and two dimensional motion. The first problem is about acceleration and retardation. In the given problem, the body starts from rest and accelerates for some time. Then the body starts retarding and finally it comes to rest. We need to find the maximum velocity, total time of the journey and the total distance travelled by the body in the given scenario. The problem is as shown in the diagram below. The second part of the problem is as shown below. Let us assume that the body has started from the state of the rest and has accelerated for a time and then retarded for some more time and the sum of these times is the total journey time. 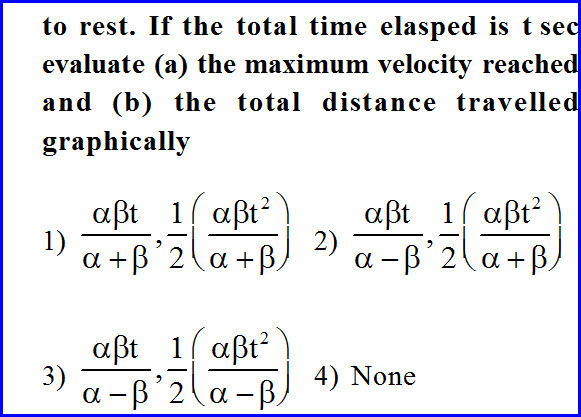 We can use first equation of motion and find the maximum velocity of the accelerated case. As the body is retarding further, it will continue to decrease its velocity further and finally comes to the state of the rest. Using that data, we can express the total time in terms of maximum velocity, acceleration and retardation as shown in the diagram below. 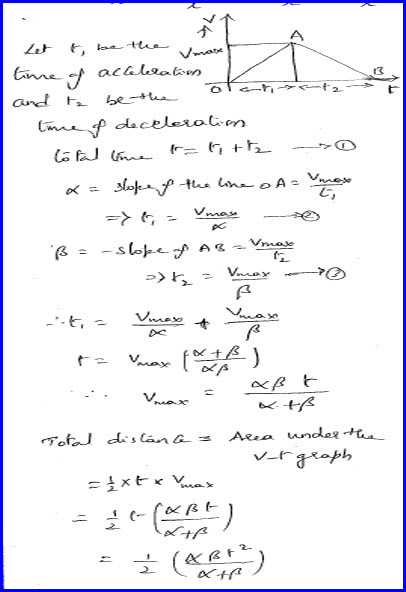 As the total time is given to us in the problem, we can find maximum velocity. This result leads to effective acceleration and hence we can find the total distance travelled by the body, using the second equation of the motion.The solution is as shown in the diagram below. 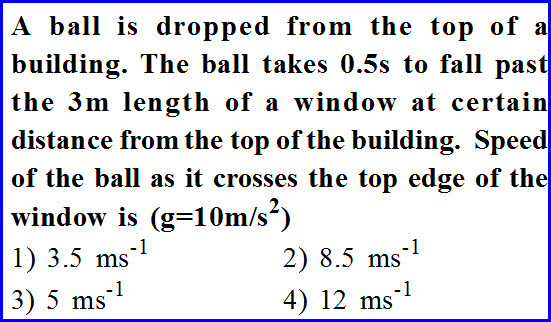 It is given in this problem that a ball is falling freely without any initial velocity and it has taken a time of half second to cross a window. We are interested in measuring the velocity of the ball as it started crossing the window. The problem is as shown in the diagram below. Let us assume that the total distance it travelled by ball before the window is X and it has taken T. Now it has to further cross the window of width three meter and it has taken half second time. Taking these two things into consideration, we can derive two equations using the second equation of the one dimensional motion. 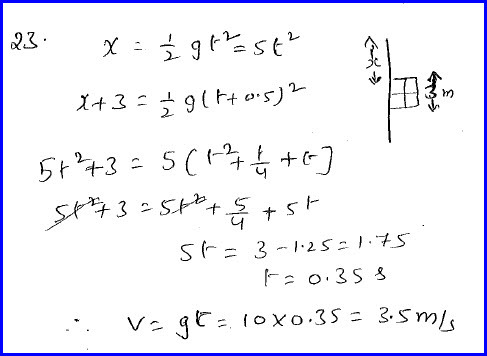 By substituting the value of the X in the second equation, we can measure the time for which the ball is travelling and further with the usage of the time, we can find the velocity of the body at the instant of reaching the starting point of the window. The solution is as shown in the diagram below. A person has jumped off from a aeroplane that is having only a horizontal velocity. He just dropped from the plane and fallen for ten second. Then he opened the parachute and stated descending with a less acceleration. If he has landed with a known velocity, we need to find the height of the plane when he just got jumped off. the problem is as shown in the diagram below. 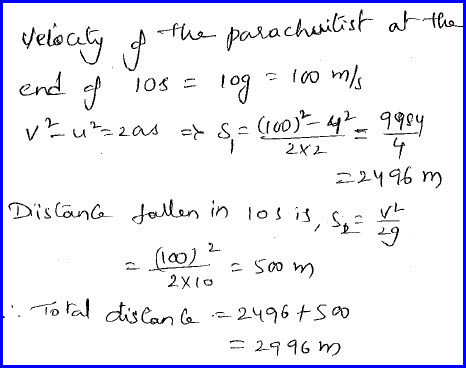 The person has no initial velocity and we can find his velocity after his journey of ten seconds. During this period he is under fall due to the gravity of the earth. He further opened the parachute and started coming down with much lesser acceleration and landed on the ground with a very minimum velocity. 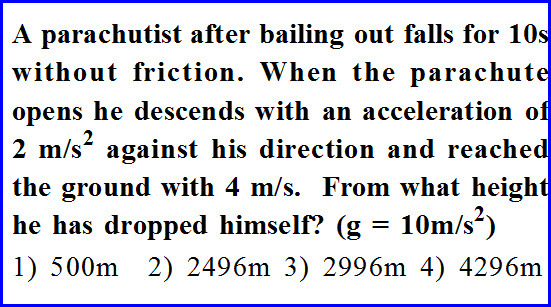 By using the third equation of motion,we can find the distance travelled by him during this second part. By adding both the distances, we can get the total height from where he has fallen as shown in the diagram below. It is given in this problem that a body is thrown vertically up with a certain velocity and it has reached a point in its path after seven seconds. We need to know after how much time, the body comes back to the same position. We have solved this problem using the second equation of the motion and basing on the data given in the problem, we have measured the height it can reach in seven seconds. Using that height, we can again solve the equation of motion and get the value of time as seven or thirteen seconds. As we want the second time, its answer is thirteen second. 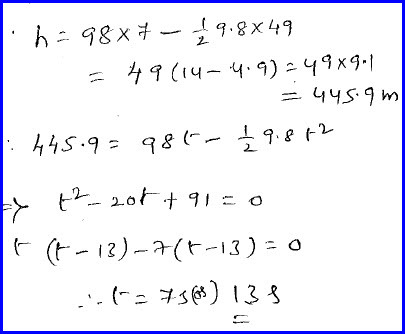 The solutions is as shown in the diagram below.